In the last core meeting we agreed that it was reasonable to merge files and documents into a single media library. To kick off that discussion I have made a series of quick wireframes. Media library is an system that organizes ALL files for a project includes those uploaded in issues or the wiki. It will help answer the question: where the heck is that image/document/file? This is the kickoff of a discussion and we are going to try to balance features versus available resources. So some awesome ideas might not make it simply because of resource constraints. Which brings me back to the question: What do documents offer more/else than the wiki? I can for now only see that they are not versioned, which for me is a reason to not even consider using them… Am I missing something? (quick answer, if this needs discussing too split it off to a new thread). It would be helpful to attach files to any issues from a central Media Library. Yeh, the idea of Media Library is to have single point of access to ALL files including attachments to the issues. Also a lot of people are using file in Redmine simply for sharing ie with WebDAV and similar access. So merging them into single Media Library which will include everything (including wiki attachments) will help users better manage project related data. I would be a huge fan and I have a couple of clients who'd love this. This is a simple version of my ideal. I constrained my creativeness. That said I know not all of these will make it into the first cut. I really love it, and as Jan, my colleagues at work would love this too. How will it be integrated in default theme ? Is there a plan to upgrade redmine default theme ? I just wanted to see how to give you feedback (e.g. "Redmine doesn't do X" versus "I like X if it was tweaked like so"). Here are my comments on the first set of ideas. On the first list view, second from the bottom: there is a floating bubble that looks like 26 comments but in the Size section. Does that mean anything or was it just a typo? What do the Category and Type filters do? Can I assume one filters by file type (png, pdf, etc) and one filters by the attached object (issue, project, wiki)? What do you propose for the UI when adding a new file? What about updating an existing file? Another thing missing is a link that can be used to copy the file's permalink. This would make it easy to copy and paste the link to a file. Should this be available cross-project too? So you can list/search every file uploaded to your Redmine that you have permission to. How will it be integrated in default theme ? Is there a plan to upgrade redmine default theme ? If some people would like to, that would be possible. We will need some volunteers to start that process and get some contributions from the community. I just posted this thread to the RedmineBlog so more feedback should be coming in very soon. I liked the idea and the design. For people that already use Files to make the software project public, like stable releases and downloadable docs, I think that should have some default categories for this purpose. And maybe use the same feature for issues filter, so users can save filters. One more comment about MD5. I do not think we need to show it in the grid I think it would be sufficient just to have it somewhere in the file details screen. Those are comments on the file iteself (not sure the attached object makes as much sense). The most common request we get about documents with our users is the ability to have discussions around a specific file. I've always been happy to force that into an issue, but I figured we should discuss it with the community. This has pretty drastic implications, no its a starting point for a discussion. Definitely not a quick easy thing. Accident - removed it from wire. Category = attachment type. Should probably rename but not sure if attachment makes sense? Maybe relationship? I'm open. Doh - totally missed the new file button and delete. i) click on file name, goes to file detail page with more info + comments. In that case we should add a download button on this table so you don't have to click twice to get the file. I'm open - any preferences? I would posit that you are the exception rather than the rule? Can we find a more buried way to show that? In the detail view? Good call. I'd suggest we consider option # 2 from the question 2 above to display that. I think that would be quite nice, although it begets the question of how these attachments are treated within discussion (issues / wiki / forum etc..). I was wondering in the new theme if we would embed automatically when uploaded (as we do now on issues with our theme), then its not all that essential, but still cool. If they don't embed thumbnails, then it is extreemly worth it. I don't know if I find that personally useful or overwhelming? What does everyone else think? I was proposing we do file version (not redmine release versions). To address redmine release versions (gosh I wish we could just call it releases), I was thinking we would handle this via tagging for the exact reason you brought up. maybe same file name, system automatically appends filename.x+1.ext. ultimatly I am not sure, but I know that in our organization, one of the biggest issues we face is which file is the one I am supposed to be looking at. So we need some way to know most recent version and even official approved version (which isn't necessarily the most recent). eric - I bat this to you. My gut is that same as it does when you delete in the object itself. I think that is an interesting question! We could technically do that using permalink references or embeds as wordpress does it. You are currently in a project. For the global list (if we do one) then you are certainly correct. 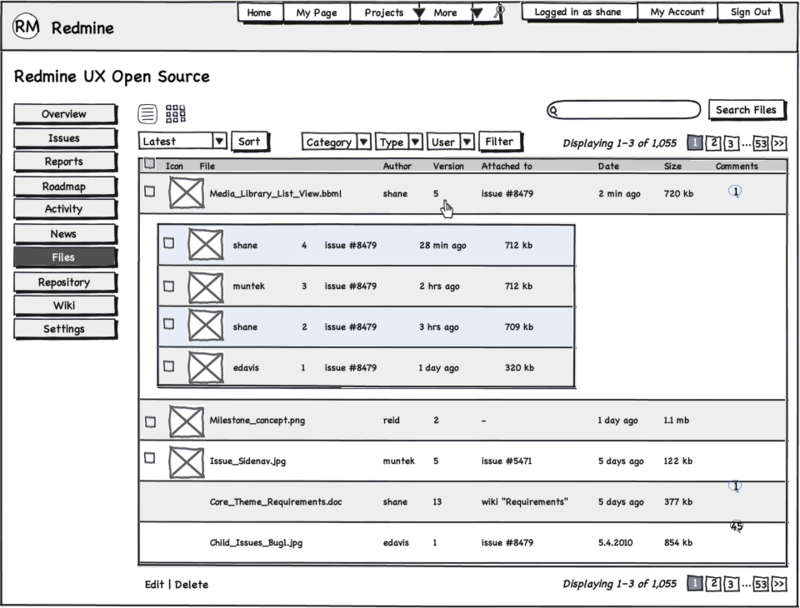 Beyond the ui discussion, can you use a common and established scm or other dms service to save and handle the versioning and metadata handling around the files? Most people won't like to save their file and history to new kind of system. The task "versioning of files" is already done and there are enough good standars to use or build on. In our case we use as scm Subversion and advanced integration via webdav. The problem is that we would need a business analyst compatible frontend for uploading (crud), versioning, watching changes and managing project documentation beyond code (there our coders use svn clients on svn server behind redmine). You could use the standard scm configured in project archiv or embedd a defined one for saving the versions of files and docs. In the case of using svn with adavanced redmine integration, you already have webdav on svn. Now you "only" need a nice frontend so some special folders on svn repo where you manage the docs and files for your project. If we allow comments on an attachment, then I think it should be feed back into the issue/wiki page somehow. Maybe a comment bubble on the issue details page where the file is listed? 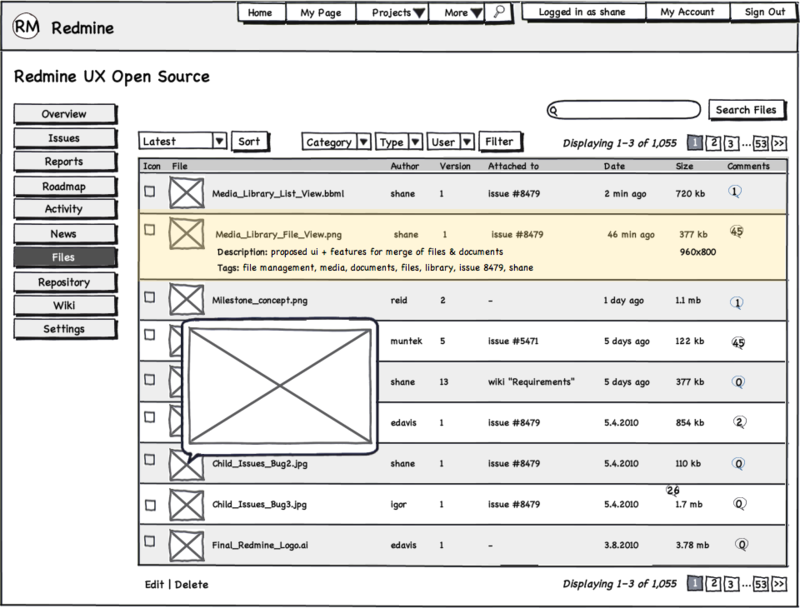 Attachment is the actual model object name Redmine uses in the code to store file uploads. I'm just wondering how this would on an issue. I think the typical behavior would be uploading a new version of a file at the same time as updating an issue. (e.g. "Here is a new version of X"). I disagree, everyone I've seen who uses the File module wants MD5 listed so people can be sure the files are correct. It might be better to just use a new view for this, File Releases. I think search cross-project would be very useful, especially if you have deeply nested sub projects and don't want to hunt for a file. I don't think that matters. A file is uploaded and gets it's own unique id. The file can then be referenced by that id. Redmine already works like this. Files are not always associated with issues nor they should be associated with them one of the examples would be best practices or policies document or some manual which is related to the project as a whole not to just one issues. I agree that File Releases view might be a best option to show MD5 as for the most upload and end users who have no idea who MD5 is this field would be just noise. I asked Terence Mill to mention the backend storage ideas after talking with him on IRC. It might end up being an separate set of features but still might help this discussion. I don't realistically see all of this in 1.1 but that shouldn't stop us from thinking about how the ideal system should look.